Galleria Schwarz, Milan; Mr. and Mrs. Fred Shore, New York; Frank Kolodny, Princeton, New Jersey; (Steven Mazoh); purchased by NGA, 1989. Making Mischief: Dada Invades New York, Whitney Museum of American Art, New York, 1996, p. 292 (unnumbered exhibition list). A Century of Drawing, National Gallery of Art, Washington, 2001-2002, no. 34. 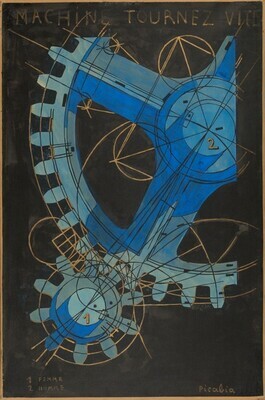 "Francis Picabia, Singulier idéal", Musée d'Art Moderne de la Ville de Paris, 2002-2003, 180-181. Dada, Musée national d'art moderne, Centre Georges Pompidou, Paris; National Gallery of Art, Washington; The Museum of Modern Art, New York, 2005 - 2006, no. 368. Stedelijk Van Abbemuseum, Picabia. Eindhoven, 1967: no. 18. Camfield, William. Picabia. New York, Guggenheim Museum, 1970: no. 50. Martin, Jean-Hubert. Picabia. Paris, Centre National d'Art et de Culture, Georges Pompidou, 1976: no. 62. Stadtische Kunsthalle Dusseldorf, Picabia. Cologne, DuMont Buchverlag, 1983: no. 27. Naumann, Francis M. Making Mischief: Dada Invades New York. Exh. cat. Whitney Museum of American Art, New York, 1996: 19, 62, 232, 282–283. Hughes, Robert. "Days of Antic Weirdness." Time (January 27, 1997): color repro. A Century of Drawing. Exh. cat. National Gallery of Art, Washington, 2001-2002: no. 34. "Art for the Nation, The Story of the Patrons' Permanent Fund: Francis Picabia, Machine tournez vite (Machine Turn Quickly." National Gallery of Art Bulletin 53 (Fall 2015): 8, repro. National Gallery of Art. Highlights from the National Gallery of Art, Washington. Washington, 2016: 282, repro.